Getaways to the Harborfront Inn can be both relaxing and adventurous, depending on your interests. Spend the weekend at our Long Island Wine Country hotel exploring the shops and restaurants of downtown Greenport, a charming and historic seaport village. Or take a tour of local Long Island wineries on the North Fork. Nearby attractions include Mitchell Park and its antique carousel, the Maritime Museum and the Railroad Museum, all within walking distance of our hotel near North Fork wineries, attractions and more. 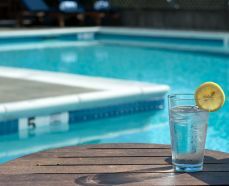 When not out exploring the North Fork, stay and enjoy our outdoor heated pool, fitness room and complimentary breakfast. Relax in your spacious room, which offers a flat-screen TV and luxurious bed linens. Coffee is also always available in our comfortable lobby. Enjoy your vacation to the North Fork at your home base.